This tuna is seared but not cooked all the way through. Use sushi quality tuna because you'll want to leave the center very rare. Combine wine, white wine vinegar, and shallots in a saucepan over medium heat. Simmer to reduce to about 2 tablespoons/30 mL. Strain out the shallots and discard. Add wasabi and soy sauce to mixture and reduce the heat. Slowly add butter while stirring until completely mixed. Stir in cilantro and remove from heat. Set aside. Preheat grill as hot as you can get it. You really need a lot of heat for this one. 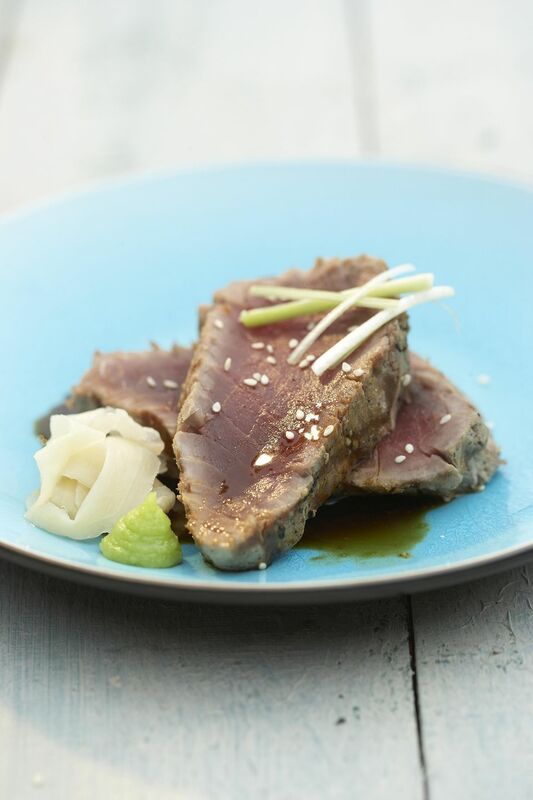 Brush tuna steaks with olive oil. Season with salt and white pepper and place onto the grill. Grill for 90 seconds then turn and continue grilling for 90 seconds more. If you just want the tuna seared remove from grill now. Otherwise, continue grilling for 1 minute on each side again.